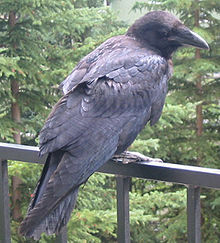 From Middle English raven, reven, from Old English hræfn, from Proto-Germanic *hrabnaz (compare Icelandic hrafn, Dutch raaf, German Rabe, Danish and Norwegian Bokmål ravn, Norwegian Nynorsk ramn), from Proto-Indo-European *ḱorh₂-. Compare Middle Irish crú, Latin corvus, Lithuanian šárka (“magpie”), Serbo-Croatian svrȁka ‘id.’, Ancient Greek κόραξ (kórax)), from *ḱer-, *ḱor-. Compare furthermore Latin crepō (“I creak, crack”), Sanskrit कृपते (kṛpate, “he laments, he implores”). Any of several, generally large and lustrous black species of birds in the genus Corvus, especially the common raven, Corvus corax. Some ſay that Rauens foſter forlorne children, / The whilſt their owne birds famiſh in their neſts: / Oh be to me though thy hard hart ſay no, / Nothing ſo kinde but ſomething pittiful. Sardinian: corbu ?, crobu m, corvu ?, colbu ?, colvu ? She was a tall, sophisticated, raven-haired beauty. From Middle English ravene, ravine, from Old French raviner (“rush, seize by force”), itself from ravine (“rapine”), from Latin rapina (“plundering, loot”), itself from rapere (“seize, plunder, abduct”). Prey; plunder; food obtained by violence. (transitive, archaic) To obtain or seize by violence. (transitive) To devour with great eagerness. I refer to the danger of keeping a dog of this nature and disposition in a bedroom, where it can spring out ravening on anyone who enters. (transitive) To prey on with rapacity. The raven is both a scavenger, who ravens a dead animal almost like a vulture, and a bird of prey, who commonly ravens to catch a rodent. (intransitive) To show rapacity; to be greedy (for something). The Greek were-wolf is closely related to the vampire. The lycanthropist falls into a cataleptic trance, during which his soul leaves his body, enters that of a wolf and ravens for blood. On one side the great temple where you can gather the good harvest—on the other a dirty little scandal that you’ve nosed out to fling to paper scavengers who feed it to their readin’ millions ravening for pornographic dirt. From Old Dutch ravan, from Proto-Germanic *hrabnaz.